Click image to enlarge Hat Rock, Oregon. 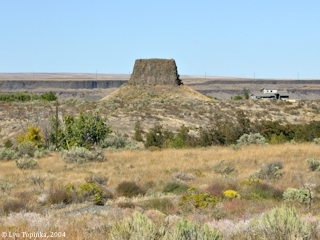 Hat Rock is a remnant of a Columbia River Basalt flow, eroded during the Missoula Floods. Image taken September 24, 2004. "... a rock in a Lard. resembling a hat just below a rapid at the lower Point of an Island in the Midl: of the river ..."
Hat Rock is located off U.S. Highway 730, nine miles upstream of Umatilla, Oregon, at Columbia River Mile (RM) 298. This unique basaltic feature is the result of the Missoula Floods stripping away the outer surface of material, leaving behind the 70-foot-high feature. Hat Rock is located within Oregon's Hat Rock State Park. Nearby is Boat Rock, another basalt feature located within the Park. Upstream is Warehouse Beach, a U.S. Army Corps of Engineers Recreation Area and downstream is McNary Beach, another Corps of Engineers Recreation Area. The U.S. National Elevation Dataset (2018) lists Hat Rock's elevation at 469 feet. Hat Rock is located in T5N R29E, Section 15. Hat Rock and Boat Rock are both Missoula Floods remnants of Columbia River Basalt flows. On a map, Captain Clark labeled "Hat Rock". While Lewis and Clark named the distinctive basaltic feature "Hat Rock", other explorers and early publications make no mention of "Hat Rock" but instead refer to a feature they called "Windmill Rock". Wilkes 1841 map shows "Windmill Rocks" while an 1858 Military Reconnaissance map calls two features in the same area "Monumental Rocks". Presumably these all are the same feature(s). Hat Rock is located at Columbia River Mile (RM) 298. In 1841 Charles Wilkes of the U.S. 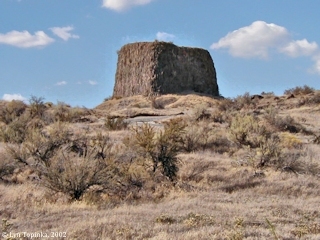 Exploring Expedition mentions "Windmill Rock" as being 18 miles below Walla Walla (RM 315). 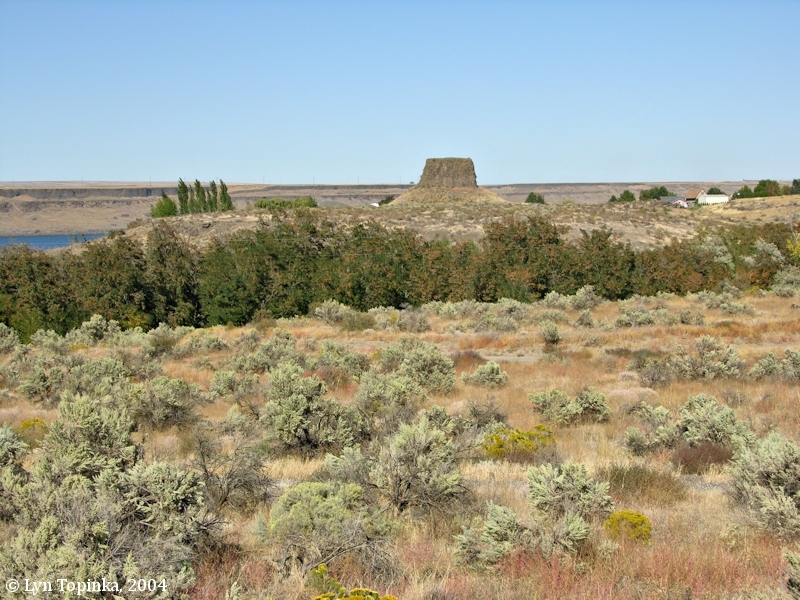 During the same era William Henry Gray in his "History of Oregon, 1792 to 1849" (published in 1870), mentions "Windmill Rock" as being 9 miles upstream of Umatilla (RM 289) and 15 miles downstream of the Walla Walla River Valley (RM 315). The 1858 "Map of Military Reconnaissance from Fort Dalles, Oregon, via Fort Walla-Wallah, to Fort Taylor, Washington Territory", shows "Monumental Rocks" in the same location as today's Hat Rock. The 1867 U.S. Government publication "Reports Upon the Mineral Resources of the United States (Browne and Taylor, 1867, "Table of Distances") lists "Windmill rock" as being 37 miles upstream from Castle Rock, 7 miles upstream from the "Umatilla rapids", 15 miles downstream from Wallula, and 201 miles distance from Portland, Oregon. Click image to enlarge Hat Rock, Oregon, and the Columbia River. Image taken September 24, 2004. Click image to enlarge Hat Rock State Park, Oregon. Image taken September 24, 2004. In 1951, Oregon acquired the area around Hat Rock, and created Hat Rock State Park. 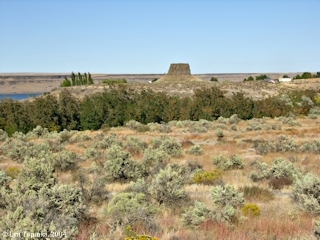 The 735-acre park is a desert oasis surrounded by rolling sagebrush hills and outcroppings of basalt. The park has its own pond stocked with rainbow trout and provides year-round habitat for waterfowl. "The original park land was purchased from private owners and leased from the U.S. Army Corps of Engineers at the time of McNary Dam construction from 1951 to 1953. Later, lands were acquired and leased up to 1968. Acreage: 719.38." Hat Rock State Park is located off U. S. Highway 730, on the south shore of the lake formed by McNary Dam on the Columbia River near Cold Springs in Umatilla County. The first acquisition was 175 acres purchased from Charles and Eileen Kik in 1951 at a cost of $5,000. Later, in 1953, another tract of 191 acres was obtained from the Corps of Engineers under a lease agreement. Two other parcels of 0.16 of an acre and 3.07 acres were acquired for the park and the road, making a total of 369.23 acres in the park. Acquisition and development of this area for recreational purposes was desirable because it is the area most suitable for development along the shore of McNary Lake. The land obtained from the Corps of Engineers includes an arm of the lake about 1,600 feet in length and a large, prominent rock, a landmark of historical significance. This landmark, known at Hat Rock, was often referred to in diaries of the early-day western explorers and travelers. The rock itself is round with a flat top and vertical sides. Hat Rock State Park was named after this large monolith, which, no doubt, acquired its name because of its likeness to a man's silk top hat. The terrain is generally rolling, cut by an arm of the lake. The cover is sagebrush and of little or no value to the park. A road passes through the park to a home development on the shore of the lake north of the park. A large, natural spring is located on the park land at normal water level near the southern tip of the arm of the lake. It flows at approximately 25 c.f.s., which furnishes plenty of water to supply the park and meet the present needs of the home development on the lake shore. Improvements at Hat Rock include an entrance road, car parking area, trails, planting trees, swimming beach, bathhouse, guard fences, two sanitary facilities, water system, park cottage and headquarters building. All roads and car parking areas are oil surfaced. The Corps of Engineers constructed a road to the west side of the arm of the lake, a car parking area, boat ramp and a floating foot bridge, and prepared and seeded a nearby area to lawn, all as a part of the park facilities. Park use in 1963 totaled 191,011 day visitors." 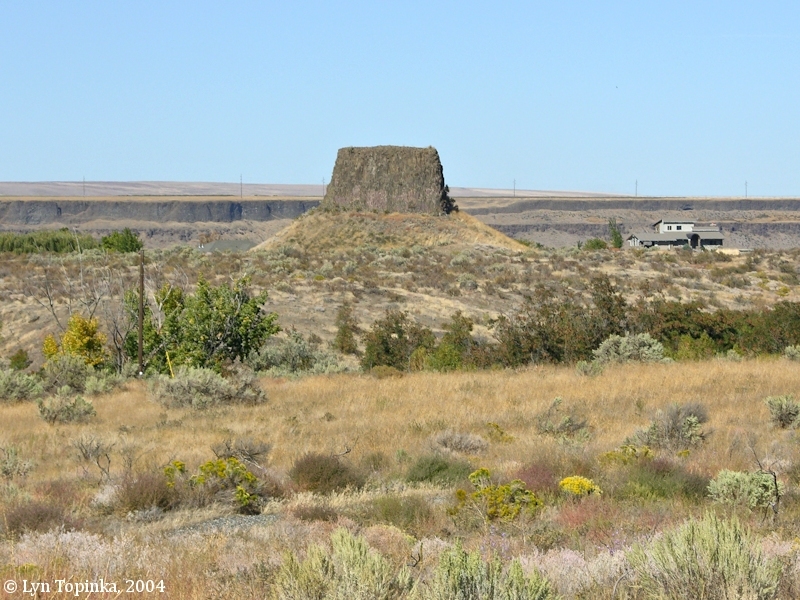 In 2002 I read that Lewis and Clark named a basalt feature which looked like a "hat". I went to see it, taking with me a 3 megapixel camera set on "low resolution", resulting in this image. The original is a meer 180K in size, a long ways from what I shoot now. Still, as small as it is, this image began this website "Lewis and Clark's Columbia River - 200 Years Later", now known as the "ColumbiaRiverImages.com" website. Click image to enlarge Hat Rock, Oregon. 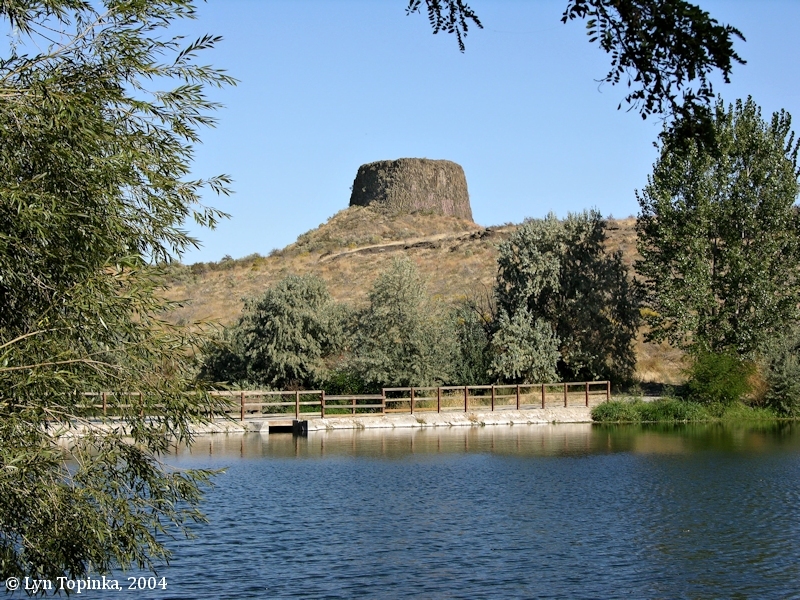 Hat Rock is a remnant of a Columbia River Basalt flow, eroded during the Missoula Floods. Image taken September 27, 2002.